There are various versions of Aloo gobhi in the North Indian cuisin.This is my recipe for making aloo gobhi and we all love it at home. Heat oil in a kadhai / wok / heavy bottom pan. Add asafetida fry for few seconds till turns pink. Add the potatoes. Fry for a few minutes now add the cauliflower florets. Add salt, turmeric powder, chili powder , cumin powder and coriander powder. Reduce the heat to low flame and cook sabji covered . 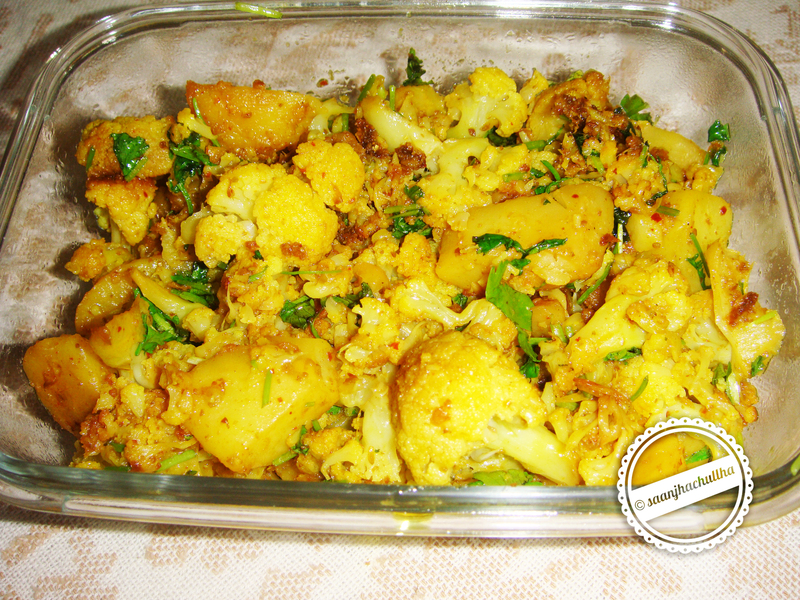 Cook about 15 minutes, stirring every few minutes, till potatoes and cauliflower are quite tender, but not mushy. Garnish with finely chopped coriander leaves and serve hot with any Indian bread of your choice!